Trump has denied that his order was a "Muslim ban" and pledged "to show compassion to those fleeing oppression"
President Donald Trump signed an executive order Friday at 4:42 p.m. 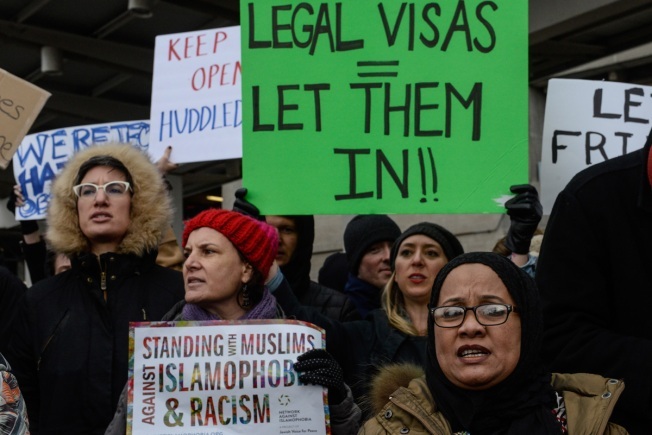 ET imposing a 90-day travel ban for immigrants from several Muslim-majority countries -- Iraq, Iran, Sudan, Libya, Somalia and Yemen -- and an indefinite ban for Syrian refugees trying to enter the United States. The order prompted a series of protests across New York City, with tens of thousands decrying the newly inaugurated president's order as "un-American" and oppressive, as more than 100 people were detained at airports, many of them without legal representation. Many more individuals, including a CUNY doctoral student visiting family in Iran on her winter break, were stranded abroad. The International Rescue Committee, with offices on 42nd Street, is urging concerned New Yorkers to contact their elected officials and offers this handy form to bypass some of the red tape. You can also donate to the organization here or learn about creating your own customized fundraising campaign. The New York Legal Assistance Group is at JFK Airport providing counseling to assist incoming travelers and their worried families. They need volunteers, particularly those who speak Arabic. Sign up here. The New York Chapter of the Council on American-Islamic Relations offers guidance on how immigrants can protect themselves and what New Yorkers can do to push back against Trump's executive order. The group invites demonstrators to participate in its rallies and accepts donations here. The New Jersey Alliance for Immigrant Justice is a statewide membership-based coalition that has joined the chorus of advocacy groups condemning the president's action. Find out how you can volunteer. The New York Immigration Coalition, an umbrella policy and advocacy organization for nearly 200 groups in the state that work with immigrants and refugees, has been at the forefront of the protests since the executive order was signed. Donate here or call 212-627-2227 to find out how you can help. Support the UNHCR, the UN agency responsible for protecting refugees, which has an office on 42nd Street and is running a #WithRefugees petition on its website or call (212) 963-0032 to learn more about how you can help locally. Direct people in need to Airbnb, which is providing free housing to refugees in the event they are denied the ability to board a U.S.-bound flight and are not in their city/country of residence. If you work for Google, the company has created a $4 million crisis fund for those affected by Trump's executive order. It can be matched by up to $2 million from employees and donations will go toward four immigrant organizations. Support individual fundraisers. Many affected people have turned to GoFundMe for help. ActionNYC connects New Yorkers to free, safe immigration legal help. You can make an appointment to learn about legal options and get immigration application assistance. For more on how you can help, visit your local governments' websites to find lists of immigrant and refugee advocacy groups in your area.